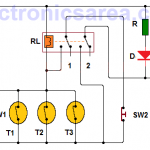 This power failure alarm circuit is very simple and is very useful. This It can be used with electric ovens, a refrigeration systems or to prevent a thief from cutting off the electrical power, because it immediately warns of the problem. It also serves you when the fuses have blown. You can connect any kind of device, at the output of the circuit (relay) to call attention, such as a light, a siren or both. See the diagram below. The primary winding of the 120/240 to 12 VAC transformer (T) is connected to the power lines, The transformer secondary sine wave voltage is half-wave rectified by the diode (D) and then flattened by means of an electrolytic capacitor (C). The result is a pulsating voltage of approximately 18 VDC. This voltage constantly feed the relay and keep it active. Relay should be a 1 pole 2 throw device. This means that the armature move between two possible contacts. The diagram below shows the diagram of a 1-pole, 2-shot relay. When there is no electrical power, relay is deactivated and the armature changes to the other throw and allows the activation of devices that give the alarm signal. (contacts C and E are active). These devices (light, siren, etc) can be powered with a different voltage source, it can be DC or AC. A DC source can be a 9V battery. See the first diagram.